If you don’t owe taxes, Can you get the credit back? What Price Ranges Are Hot? You’ve heard reports that listing inventory has been coming down for many months. This is true, and not only have buyers absorbed all new inventory coming onto the market, they have also helped to purchase a backlog of existing inventory as well. We wondered if inventory levels relative to home sales were declining in all price segments, so the first thing we did was looked at what the month’s supply of inventory was back in January in our State of the Market Report. We decided it would be interesting to compare inventory levels from about 8 months ago to where they are today and sort them by price range to see which price ranges are hot and which ranges are not. The results are in and you can tell by the graph that the most dramatic changes are in the 0-$100,000 range and the next one up at $100-$200,000 ranges. Months supply of inventory fell dramatically in the entry level markets, down from over 20 months to just over 4 months. First time home buyers and investors are scooping up these bargain properties as quickly as they enter the market. The 100-$200k range has also done well, declining from 12 months supply to 7.82 months supply just since January. As we reported last week, the first time home buyer tax credit is helping first time home buyers in the entry level market and this graph supports that. However there is nothing in the tax code that helps the broader market and perhaps this is why we haven’t seen the move-up buyer. In fact, we have seen many first time home buyers buying short sales and foreclosures. As we know the banks won’t be buying anything after the foreclosure sale and short sale sellers won’t be buying for a while until their credit is repaired. This is why we’ve advocated an across the board tax cut for all buyers. The real estate market is 26% of GDP and has led the economy out of each recession. Our economy would be better served if we invest in strengthening the entire real estate market and it will lead us out of this recession. We’re not in favor of all these government bailout programs. However, if we are going to invest money it would make sense to spend it in areas that actually may work vs. what our government has been doing. We’ve seen TARP money for the banks, a stimulus package that so far hasn’t produced jobs as advertised, and a bailout for auto companies. The cash for clunkers was a success in that it spurred car sales. If spurring across the board home sales helps get our economy back on track, it might be worth looking at. Once we get to the $200k+ range the numbers begin to look eerily similar to what they were in January. There is improvement, and I’m sure all SW Florida home sellers will take improvement where they can find it. We are not seeing improvement in sale prices and in fact sale prices are still falling in the $300,000 + ranges. We have seen a bottom form in the entry level home prices, and certain waterfront property seems to be holding its own as well. One bit of good news is we are seeing northerners buying second homes in SW Florida as prices have dropped to affordable levels. Northerners are afraid these bargains may not be here in a few years when they’re set to retire and in many cases they may be right. Prices are below replacement cost and this will not last forever once inventory is absorbed. While there is pent-up demand for bargain properties, there could also be pent-up supply from home sellers who would like to sell but just can’t today due to the prices. Once the market levels out across the spectrum, it will be interesting to watch and study those forces. For now, we see another year of banks shedding bad loans. We expect several of the large banks to essentially double the foreclosures. All you have to do is study their SEC filings to see that this coming year most banks are budgeting twice as much in write downs as they did last year then do the math. The good news is our market is absorbing that inventory. The bad news is that pent-up supply of home sellers who would like to sell may be put off in time. Let’s just hope enough can hold on until we adjust through this next wave, and let’s hope Congress addresses strengthening the entire real estate market, not just the entry level. As you can see by the graph, home sales aren’t trickling up. If we strengthen the entire market, there will be less bank foreclosures, more families will stay in their homes, and the economy recover sooner, thereby creating jobs again. Is First Time Home Buyer Tax Credit Helping the Market? I recently attended the Star Power convention in Denver where the presidents or founders of RE/MAX, Prudential, Coldwell Banker, and Keller Williams spoke about where the market is today and where it’s going. Dave Liniger from RE/MAX stated that nationwide we have a market fueled by investors and first time home buyers, but we’re lacking the move-up buyer in this market. Jim Gillespie from Coldwell Banker agreed, and shared some interesting stories from Capitol Hill on his efforts to change the First Time Home Buyer Tax Credit to help the entire market. It’s well known that tax codes effects home buying activity. Look no further than the interest deduction and you can see why whatever Congress does impacts the entire market. We can also look at the cash for clunkers program as an example in another industry. The problem with only offering the credit to First Time Home Buyers is they will buy, but there’s no incentive for anyone who is selling to sell and move up. So we end up with a bottom forming on entry level homes and stagnation in the mid level and secondary home market, which arguably needs more help than any other segment in SW Florida. As you can see from the attached chart, 87% of Lehigh Sales and 74% of Cape Coral home sales have been distressed in the last 3 months, as this is where the majority of entry level speculator homes were built. Fort Myers to a lesser extent stands at 62%, and that number grew last month. By distressed we mean either a short sale or foreclosure sale. This has put pressure on median sale prices, and illustrates that first time home buyers and investors are the majority of the buyers right now. Jim Gillespie and others are lobbying Congress for a $15,000 tax credit for all buyers. The $8,000 tax credit for First Time buyers is set to expire December 1, but we’ve heard this may get extended in October if the economy doesn’t pick up steam by then. But what about helping the overall market, not just one segment? We’ve helped solidify to some extent the entry level market, and we’ve done nothing for the mid market on up. We’re talking $200,000 market and up in Lee County, the same market that used to be $400,000-$600,000 a few years ago. Yester year’s prices aren’t coming back, as the market has done a reset. However, we could inject infusion into this segment as well and keep it from further declines and get this economy moving again. Real estate has led the US economy out of each recession, and it stands to reason it will do it again. 21% of the nation’s GDP is real estate related. If the economy is the #1 issue right now, then what are we waiting for? Could you just imagine the new activity that would occur if there was a $15,000 tax credit for all buyers? Imagine how many people from up north could come by a 2nd home in Florida, or how many move-up buyers might pull the trigger and move, especially with today’s bargains. A recent study showed nationwide a real estate sale generates $63,101 back into the economy. This is based on everything from new carpet sales, appliances, commissions, closing fees, plus the propensity of money at about 1.5%, meaning when you go out and spend, the vendor you just bought from also goes out and spends into the economy. The truth is investors and first time home buyers were already buying in SW Florida before the tax credit. Our buyers were limited to first time home buyers and investors only because the properties they’re buying were such great deals, and we’re happy the first time home buyers are getting a tax credit on top of a great deal. I’m sure it has spurred even more buyers off the fence. We would like to see all buyers benefit, and if we speeded up the recovery of the real estate market, not only would the economy benefit and we’d get people back to work, but we’d also protect banks from more foreclosures going forward. We know foreclosures are about to pick back up again, and many will now be in that mid market and upper range. Come on Congress, let’s make this happen, protect our banks, and get people moving again and get this economy and real estate market on solid ground again. 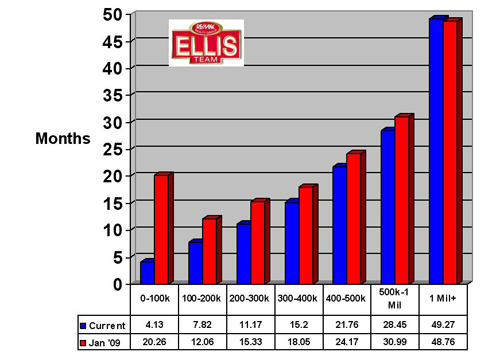 About 8 years ago the Ellis Team created a market index that accurately predicts the SW Florida real estate market. It helped us in 2005 warn the public that the local real estate market was about to turn. Later in the fourth quarter and on into 2006 people began to realize the train had run out of steam. 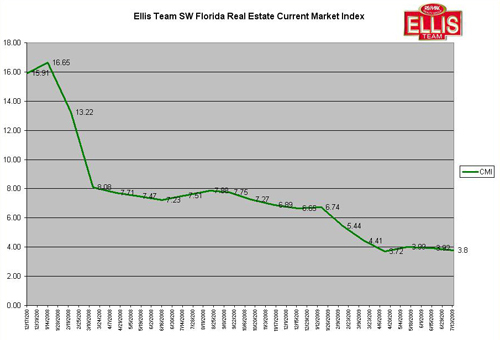 We named it the Ellis Team SW Florida Current Market Index. Since unveiling this index, the National Association of realtors came out with a similiar index called the NAR Pending Home Sales Index, which also predicts future closing activity, but it doesn’t measure the overall health of the market. Our local index measures pending sales, but also takes into account listing inventory and measures the overall health of one against the other. It tells us if properties are moving relative to overall supply. This is important because in a good market, it may actually be more of a seller’s market than people realize. In a hot market, sales are held back by the supply, meaning if there were more supply, chances are, there would have been more sales. The CMI Index numbers peaked out in January of 2008, and back then we started telling the public sales were about to pick up and inventory would start declining. Sure enough, that’s exactly what happened throughout 2008 and into 2009. Our Index was at it’s lowest in April of 2005 and at it’s highest in January of 2008. The higher the index number, the more of a buyer’s market it is and the lower the number, the more of a seller’s market we have. 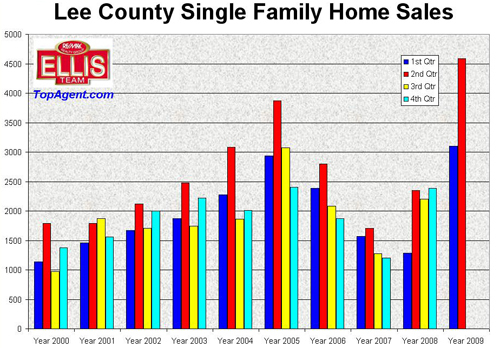 Back in July of 2005, the overall Lee County Index stood at only 1.07. As we know all too well, that was about to change drastically. The numbers shot up to 2.11 by September 2005, and 3.44 by October. So what do the numbers tell us today? Our index hit 3.72 in April and stands at 3.80 in July of 2009. 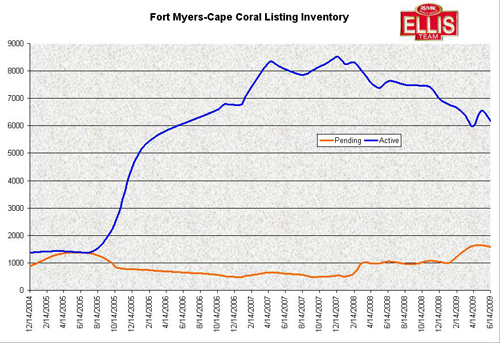 This tells us inventory levels have been decreasing as predicted and pending sales have been increasing, as predicted. In fact, last month we sounded the alarm that June sales could reach record levels, and they did. July’s numbers when released should be strong as well. Don’t confuse this with rising prices just yet. The market is strong in sales volume, but we’re in a new market that has reset, and prices aren’t going back to 2005 levels. We are starting all over from scratch and 2009 is the new baseline, and as the market heals, the baseline will have room for future price appreciation, with moderation. We update this graph each month on our Blog, blog.topagent.com and we look forward to providing this insight to News Press readers in the months to come. Its one thing to have a Feeling about what the market is doing, however really studying the actual facts and charting trends helps to better understand what the market is actually doing, and where it may be headed. Nobody can know with absolute certainty what will happen in the future, so we look to statistics to give us our best guidance. Statistics are our radar so to speak. We really try to look at the data with an unbiased eye, meaning we’ll let the data speak for itself and tell the story, as opposed to hypothesizing what the story should be and trying to prove it. We’ve been right, and we’ve been wrong, and the point is we’re not attached to the outcome of our predictions. We simply lay it out there and let you decide based upon the best facts we have at the time. We’ll be running a new batch of numbers soon, but the July Index appears to show a strong market going forward for the next few months. It looks like July and August sales numbers should be in good, and we look forward to the release of official numbers on August 21. We won’t be surprised if July’s numbers are big, perhaps up as much as 100% or so, but down slightly from June’s record numbers. 2009: Housing Bust or Housing Boom in Sw Florida? Its official, the 2nd Qtr of 2009 set the All-Time record for single family home sales, eclipsing the 2nd Qtr of 2005 by a wide margin. Many people don’t realize that the 1st Qtr of 2009 also set the All-Time home sales record, and the 4th Qtr of 2008 was nearly a record. Home sales in June were up 137% over 2008, a trend we’re seeing regularly throughout SW Florida. The reasons sales are up are numerous. SW Florida has received much International attention which has drawn interest to the area. We’ve sold many more homes this year to Canadians who can now afford to buy some sunshine at affordable prices. We’re also selling more homes to people from up north to use as a second vacation home, another encouraging sign. Perhaps the two largest segments of buyers right now are the 1st-time home buyers and investors. First-time home buyers are trying to cash in on the chance at the American dream with low interest rates, a potential $8,000 first-time home buyer tax credit, and affordable pricing we haven’t seen in years. Most of these buyers were priced out of the market in years past, and now is their chance to live in their own home, cut their own grass, and have their chance at building wealth. That chance is alive and well, as home sale prices today are well below replacement costs, so builders can’t even afford to build at these bargain prices. No builder is willing to lose money right now when a buyer can buy for less that the cost to build. This trend will end when there is no more inventory, and as you can see by last week’s graph, inventory levels are shrinking. Lastly we come to the investor. Today’s investor is much different than the speculators we saw in 2004-2006. Many of today’s investors are paying cash vs. the over-leveraged speculators who leveraged everything and didn’t qualify for anything but maybe their own personal residence. Today’s investor isn’t looking for the quick flip, although we have seen a few successful flip transactions. Today’s investor recognizes bargains, and they’re buying up properties, rehabbing when necessary, and renting them out for cash flow. In the future, each investor will decide on their own whether they want to sell at normal pricing, or keep the property for positive cash flow. Positive cash flow is a term we never really used to hear much about in SW Florida because it was so hard to accomplish, even before the so called Boom of the 2000’s. But was the Boom of the 2000’s really the boom? We can say with certainty that prices went up for awhile, before they came crashing back down, giving up all the gains and then some. Some people made money, and a lot of people lost money, including the banks, tax payers, etc. The opportunity to make money was limited to when you could get the new construction completed, and the demand was false. All that happened was the supply side sped up, bringing needed housing to market much sooner than the demand. So today we have more supply than demand, however that will change in time. Today’s buyer has more opportunities for success going forward than any buyer did in 2005. 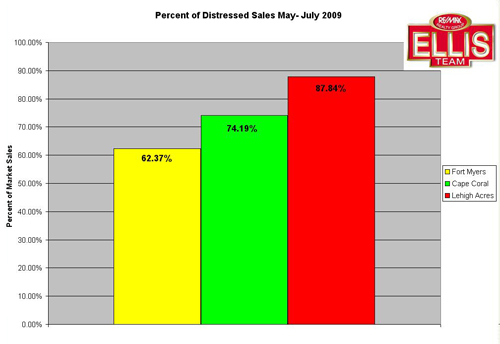 Sales are stronger in 2009 than they were in 2005. Prices are more affordable, interest rates are low, and there are tax incentives in place now. In fact, we’re hearing that if the economy hasn’t picked up by October, Congress may extend the 1st time home buyer tax credit scheduled to expire Dec 1, and some are saying it should be opened up to move-up buyers as well. We would argue the market in many ways is much healthier today than it was in 2005. Many might ask, how could anyone say this market is healthy? The truth is even with the foreclosures, the market has been cleansing itself for the last 4 years. It may not be healthy today, but would you rather buy a home today or one back in 2005? We would say it would be healthier to buy one today than back then, and most people call back then the Boom. We think we should change the conversation. 2005 was not the Boom. It was not healthy. There was little to any chance of making money, and first-time buyers couldn’t afford to live here. Nothing was good about the 2005 market, it was all false. So let’s stop calling it the Boom. I don’t know if 2009 is the Boom, but if your definition is record sales, affordable housing, Real opportunities to make money in the future, and healthier lending standards, then this is all true today. It just seems more sensible to call 2009 the Boom than 2005. If you’re a seller or facing financial difficulty, Boom may not excite you. We’re just saying the last so-called Boom is what started the pain and misery, and it’s going to be real estate that pulls the nation out of recession going forward. Real estate recovery leads to eventual job creation. We may be a few years away from construction jobs coming back to SW Florida, however the market has been well on it’s way to healing itself for years now, and we at least have those painful years in our rear view mirror. I’d much rather be sitting here in 2009 and think of the market as the Boom than back in 2005 thinking everyone was going to make money on their next Flip. Today is the Boom, 2005 was the Bust. The Ellis Team has so many leads we need to hire experienced agents. SW Florida is experiencing record sales numbers, and buyers more than ever are looking to purchase real estate in SW Florida now that it’s affordable again, interest rates are low, and of course the First Time Home Buyers Tax Credit. The Ellis Team at RE/MAX Realty Group in Fort myers has not cut back on advertising, but rather has refocused on advertising that actually works. In some cases we’ve increased our advertising, as is the case with The News Press and NBC. We’ve continued our radio show for 9 years, our Yellow Pages ads, and we’ve increased marketing in other areas. We’ve eliminated a few advertising venues that didn’t prove to work, and we’ve recently added a few opportunities that we’re really excited about. We’ve changed our office staff and we’ve never been stronger. This is the market to hire key people and march forward, and we’re doing that. Average isn’t good enough anymore, and it’s never been good enough for us. This market ha given everyone an opportunity to evaluate what’s working and improve upon it, and eliminate what’s not working. We’ve improved our personnel tremendously and getting much more accomplished. We’ve never felt better about our team, and we’re excited about opportunities moving forward. We recently attended the Star Power Convention in Denver and listened to the Leaders of RE/MAX, Coldwell Banker, Prudential, and Keller Williams. All four had interesting things to say about where the real estate industry is going in the next 5 years, and all agreed that mediochre won’t cut it in today’s market. You can’t just give average effort, or you’ll end up going backwards. You’re either evolving or dissolving according to larry Kendall, owner of Kendall Real Estate and author of Ninja Selling. Our advertising and systems are working. We’re creating more leads than we can handle. We’ve sold more properties than last year. We’re handling foreclosure accounts, getting short sales through, and helping regular sellers sell in this market. We need good quality agents to help handle the leads and sell. We have the administrative team to handle the details for our agents, which frees them up to work with more customers. If you’re an agent struggling in this market, check us out. We’re growing, and we’re looking for a few good agents to grow with us. Let our 20+ years of selling and training experience put you on a path to success, no matter what the market does. Call us for an interview. market, and where the market may be headed. continued to flood the market, and you can see very quickly what was about to happen. height of the Boom back in 2005. So why isn’t everyone reporting this as the Boom? party with 6 of your closest friends who were flipping houses and making money. unemployment is high, oil is still high compared to 2005, and home sale prices are low. they ever were in 2005. 2005 was a false market as nothing was what it appeared. until the market sorts it out. insights as to where it may be going in the future, so you can make informed decisions. affected the exact same way. itself. Stay tuned each week and we’ll present more insights.